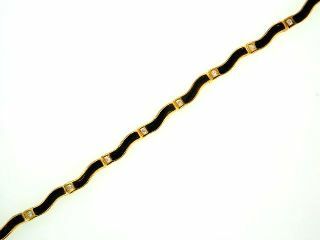 A 18K yellow-gold bracelet set with Black Coral gemstone and faceted round Diamonds totaling to 0.20 carats. Bracelet Sizing Policy: Please allow an additional 7 to 15 days for bracelet size more than 7 inch. We will be happy to custom make this bracelet in your size and mail to you.